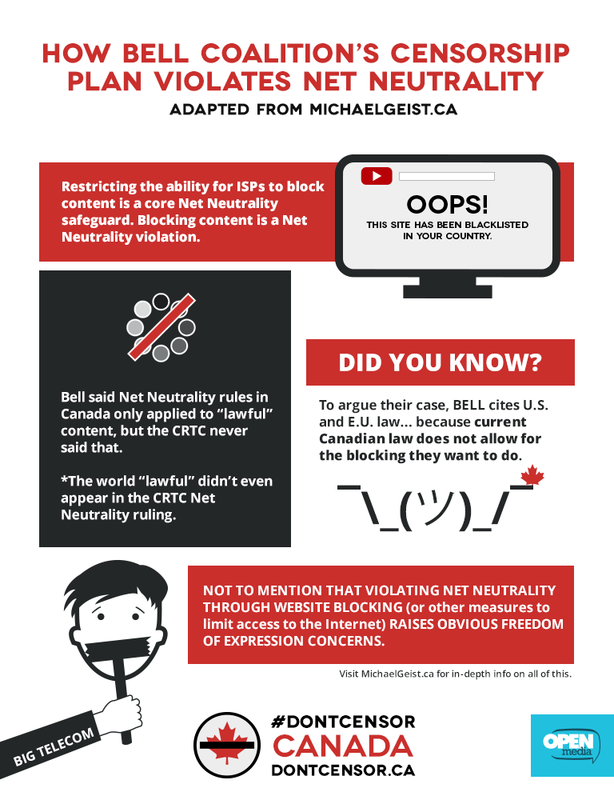 A coalition of organizations — spearheaded by Bell — is asking the CRTC to implement a website-blocking system to curb piracy. They want to create an official Internet censorship committee within the federal government, without court oversight. So, we gathered our own coalition: One that has Canada's best interests at heart. And today a coalition of more than 30 organizations and businesses — including digital rights groups, library associations, independent Internet service providers and civil liberties organizations — are standing together against this website blocking plan. We still have until March 29 to collect comments to the CRTC — add your voice now! 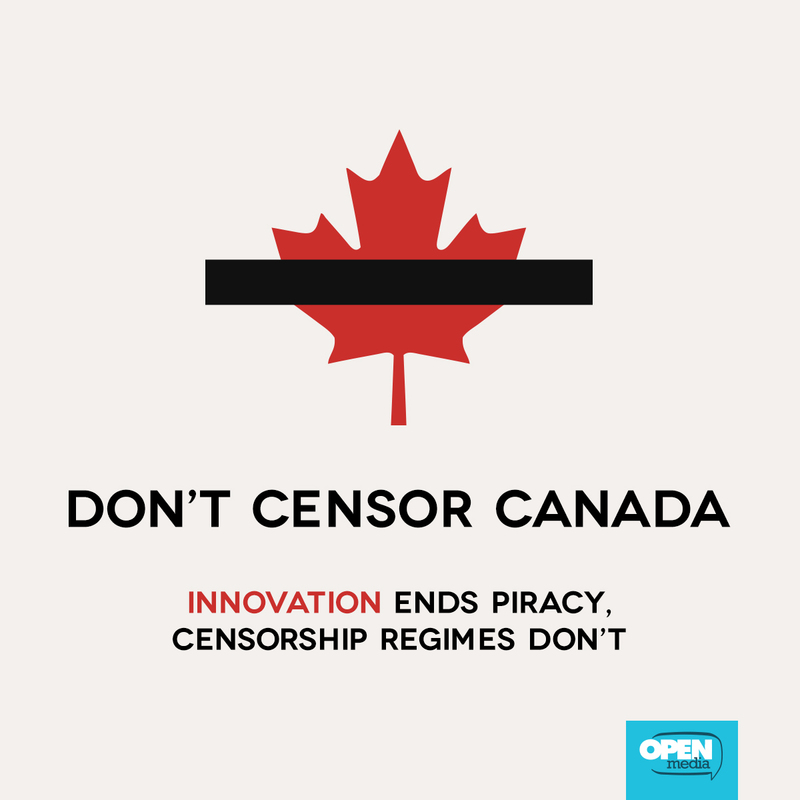 The message is clear: Canadians do not want Bell's dangerous and overreaching censorship proposal. THIS IS KEY: Submit a comment to the CRTC now using our easy tool above or navigate to the CRTC's website and file your comment directly. 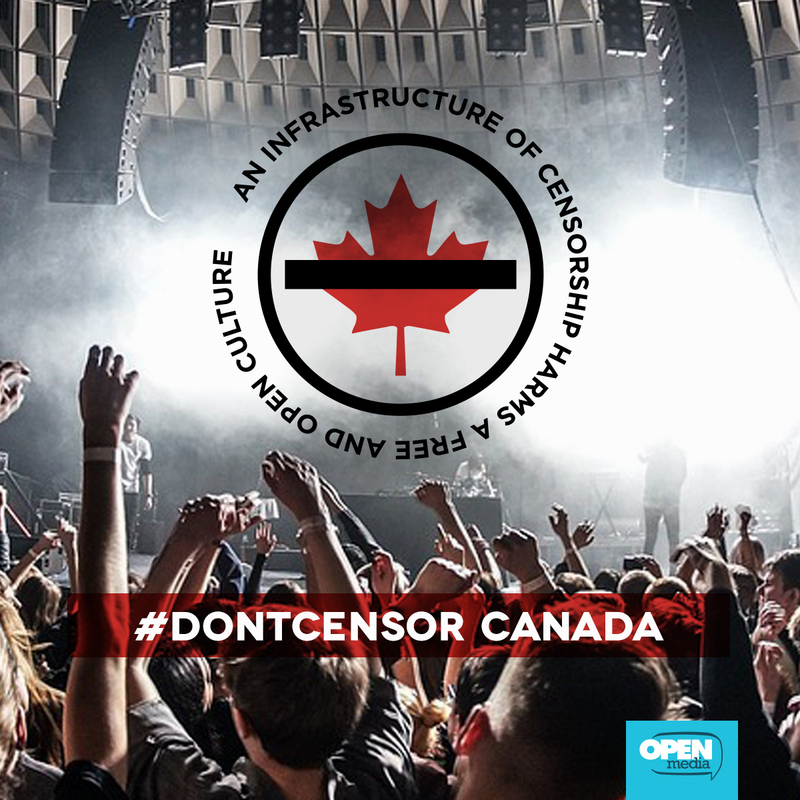 Share this site, DontCensor.ca, over email or take to Facebook, Twitter, and Reddit! 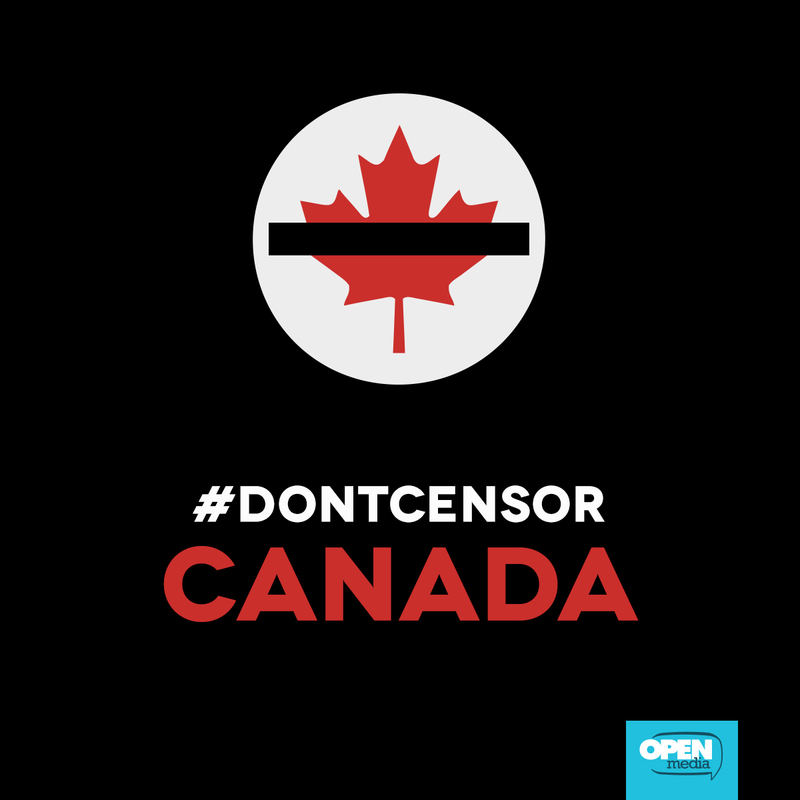 Change your profile pictures and ask your friends to stand up to Bell's censorship scheme. You can also use this tool to add a censorship bar to your existing photo. 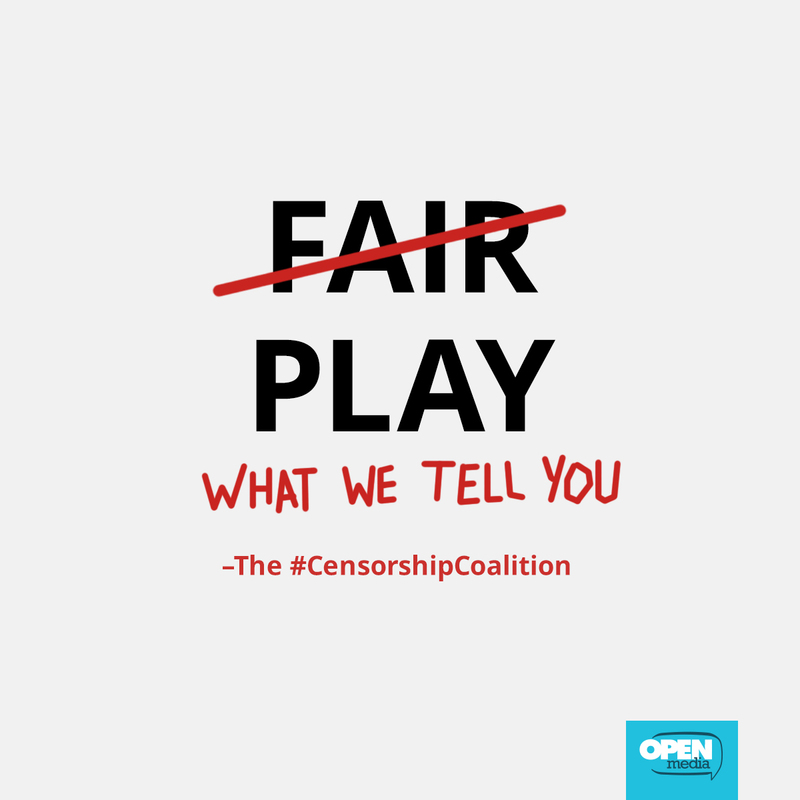 Tweet the so-called "FairPlay" coalition directly: Use this easy tool to make it clear you don't approve that they have signed on to this dangerous proposal. Have a website? Add this alert that pops up when someone goes to your page! 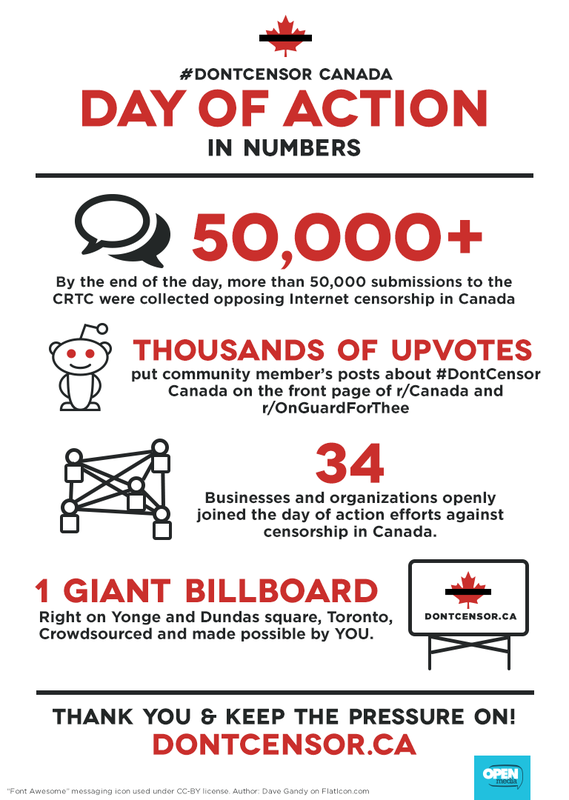 We had 50,000 comments into the CRTC by the time the clock struck midnight on March 1 — now we have to keep going! We have until March 29 to collect comments, and we can't do it without you. Use these images on Facebook and Twitter! We've made some great ones, right click and save below, or find them (and more!) in a folder, or make — and share — your own! Stuck for inspiration? Here is some wording of example Facebook and Twitter posts you can use, and here are share images! Are you an organization or company? Want to know how you can take part? Add your information to our Google Form or email katy@openmedia.org with your name and organization, and we’ll follow up with more information. Are you an artist or online creator? We want to know how you think these rules affect you! Do you think they are in your interest? We are looking for input from artists if you want to take part, please email katy@openmedia.org.